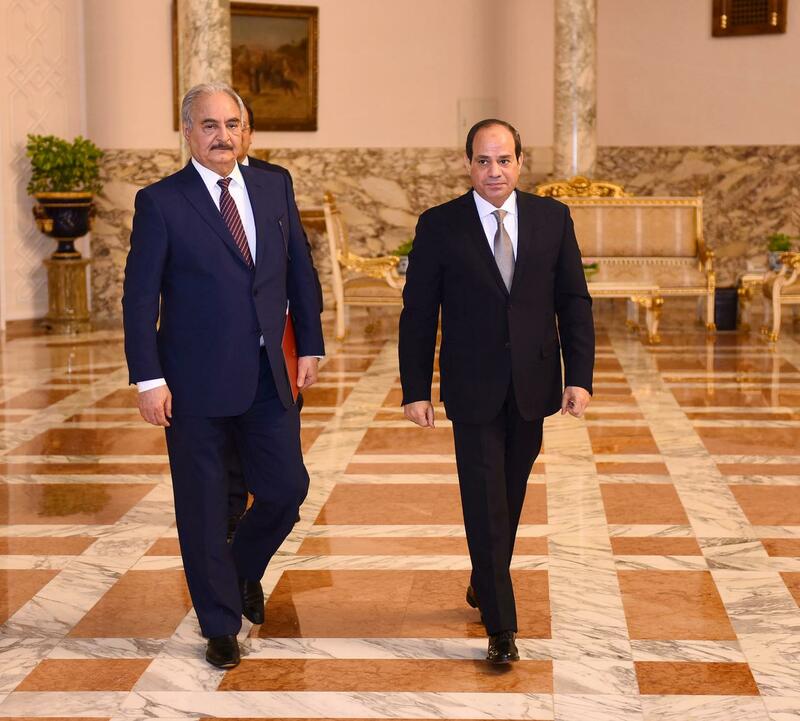 Haftar and Sisi in Cairo. Egypt President Abdel Fattah al-Sisi met Khalifa Haftar, commander of eastern-based Libyan forces, who is under international pressure to halt an advance on Tripoli. Egypt has close ties with Haftar, whose Libyan National Army (LNA) controls the east and swept through the mainly desert south earlier this year before moving on Tripoli ten days ago in an escalation. Haftar projects himself as a scourge of Islamist militants and the militias that grew powerful after the uprising. Rivals say he fuelled conflict and risks returning Libya to authoritarian rule. Egypt and the United Arab Emirates publicly support UN-led peace efforts in Libya, while being seen as Haftar’s closest regional allies. Sisi, a former army chief, led a far-reaching crackdown on Islamists in Egypt and blamed Libya-based militants for cross-border attacks. A statement from Sisi’s office “confirmed Egypt’s support for efforts to combat terrorism and extremist groups and militias to achieve security and stability for the Libyan citizen”. The presidency released photos showing Haftar sitting with Sisi and his head of intelligence Abbas Kamel. Haftar’s campaign disrupted UN effort to bring the rival administrations to the negotiating table. Sunday was the day the United Nations had hoped to hold a national conference in Ghadames. Fighting killed 121 people, mainly fighters and wounded another 561, according to UN tallies. Some 13,600 people fled their homes. Fighting has recently berernon the outskirts of Tripoli as LNA forces bog down by groups aligned with the Government of National Accord (GNA). The front lines were mostly calm on Sunday but military sources said an eastern Libyan warplane crashed in southern Tripoli. No further details were available. The 75-year-old Haftar’s push for Tripoli took many by surprise and brought calls for a ceasefire. By moving forces west, his eastern home base is exposed and it may be hard for Haftar to retreat without losing standing among friends and foes alike. While some pro-Haftar media predicted a quick victory, Tripoli government forces halted him near an airport largely destroyed in previous fighting five years ago.